This is the window in our hotel room. 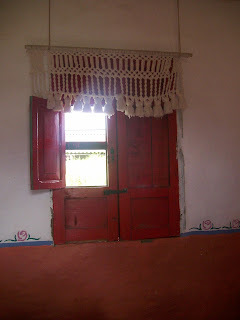 What I like about Salento is its color. That could be said of Colombia too. Bright colors. 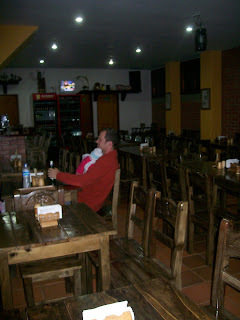 When I walk through town, I see people leaning out their windows, standing against door jambs, just watching what there is to watch: horses clip-clopping uphill, a mom circled by three dark-haired kids, backpackers here for a night or two. I thought about the front porch and wondered why we don't sit on front porches anymore, just watching what there is to watch. I was also reminded of a story Justin told me about his neighbors, a retired couple would would park their lawn chairs in front of their open garage door and just watch summer happen. Hm. Thinking of my parents' place this past summer, maybe we don't sit on front porches because the mosquitoes will eat us alive. Anyway. Salento was great. Quiet. Justin went horseback riding while Claire and I had a day in town. 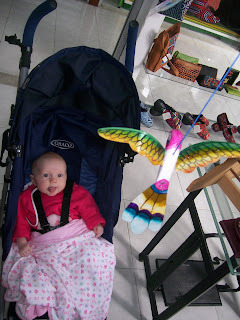 We wandered through a few shops and Claire was fascinated by a hummingbird mobile. You qualify for the early-bird special. Early-fish special?